Marion Heavens on the footbridge from Leederville station. 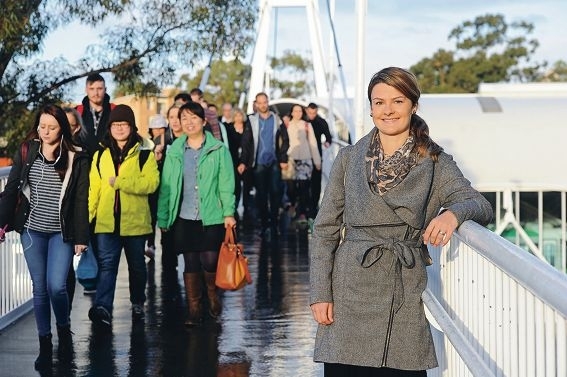 Commuter chaos was expected with the closure of the train stations, due to the new Fremantle line being connected and tested, but Mrs Heavens said all went smoothly from her experience. ‘I usually drive to Stirling, go to the gym, then catch the train into the city on the Joondalup Line,’ she said. While thousands of commuters had their travel plans disrupted by the shutdown, many adapted and used the buses that were provided instead, she said. Despite being caught out in the rain a few times, while making the walk over the three working days that the stations were closed, Mrs Heavens said she would do it all again in the next shutdown from July 31.